In a nutshell: We make clean energy easy, accessible, attractive and affordable for our clients. 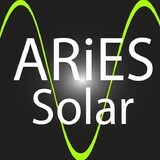 Aries Solar is a leading energy contractor founded in 2010 to deliver turnkey, clean, and renewable energy solutions such as solar PV as well as energy efficiency services and biomass gasification solutions to residential and commercial clients. While we made our name in solar installation, Aries Solar offers an array of products and services that support Economic Development, Energy Independence and Environmental Stewardship. Evaluate: Feasibility Studies, Performance Modeling and Monitoring Reduce: LED Lighting, Heat Recovery, Building Envelope and Power Conditioning Produce: Solar PV, Composting and Gasification Aries Solar develops strategies to avoid rising energy costs and provide the quickest return on investment for our clients by leveraging a combination of incentives, grants, and appropriate technologies. Along with off-grid solar, wind and hybrid energy systems that include batteries and backup generators, there are also grid-tied solar and wind operations. Grid-tied systems are attached to your Knoxville, TN utility company so if you produce more energy than you use, your meter goes down and you build up energy credits. Find solar energy contractors in Knoxville, TN on Houzz. Search the Professionals section for Knoxville, TN solar energy contractors or browse Knoxville, TN photos of completed installations and look for the solar energy contractor’s contact information.